Personal Branding is how people remember you. If you do not brand yourself, others will do it for you. Don't let others create YOUR Personal Brand! 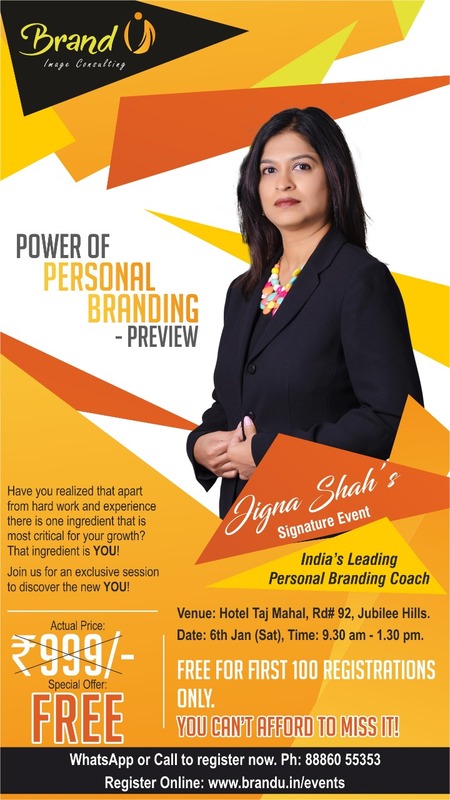 Attend this preview seminar to see how you can create an attractive, strong and a successful personal brand. You are your biggest asset. Learn how to get the best out of it. Leverage the Human Psychology to leave Your Mark! "The Power of Personal Branding" is amazing. Even though it is only a 3 hour program with just the basics of image management, the content is amazingly well thought out. The use of ABCDE to explain the image management as a novel idea and registered very well in my mind. I am already looking forward to attending the in-depth worskhop with my friends and family." We were delighted to participate in the 3 hour seminar organized by you at Image Consulting, Banjara Hills yesterday. The lucid presentation, interaction with audience and self assessment exercises ensured our full attention on a Friday evening. Am positive that many first time entrepreneurs and young professionals would benefit from the Image Blueprint enhancement. Indeed, it is an important takeaway from the seminar and the planned intensive workshop. The ABCDEs of first impression from Appearance to Etiquette were nicely connected through anecdotes and personal testimonies. Wishing you and the participants the very best from us true Hyderabadis ! Thank you for offering us an initiative of this kind. I thoroughly enjoyed your workshop. Your exuberance and subject expertise kept us all enthralled and not to forget all your endeavours that made the workshop participative and interactive. A Saturday well spent. What a joy it was? I wish you all the luck in your future endeavours. I recommend your work for anyone who wants to create a mark towards success in life and profession. “Very pleasant and insightful session, really helpful to understand the importance of image appearance and communication. A must attend to every individual to enhance the beauty inside and out. Thanks Jigna Shah for an insightful session!" “Absolutely fantastic learning program! Surely will attend the intensive session."